For the third straight Thanksgiving week I was in the Caribbean. Someone has to do it! 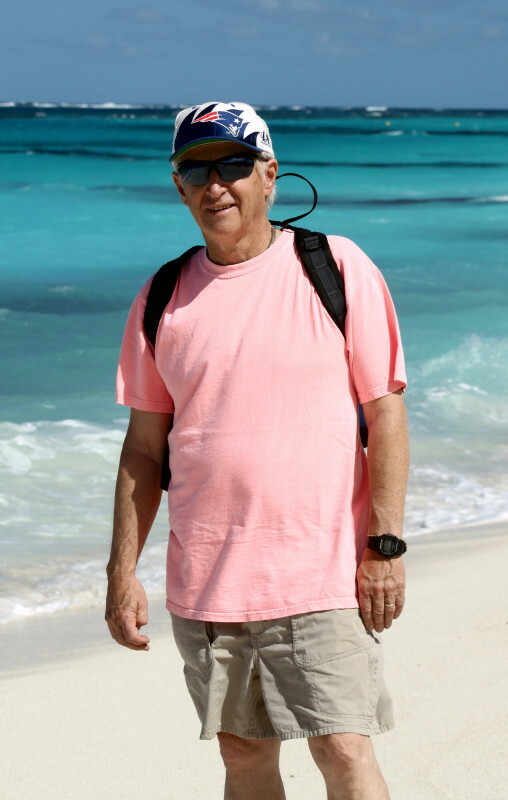 Anguilla is east of Puerto Rico and in between my two previous year’s vacation spots – Turks & Caicos and Barbados. 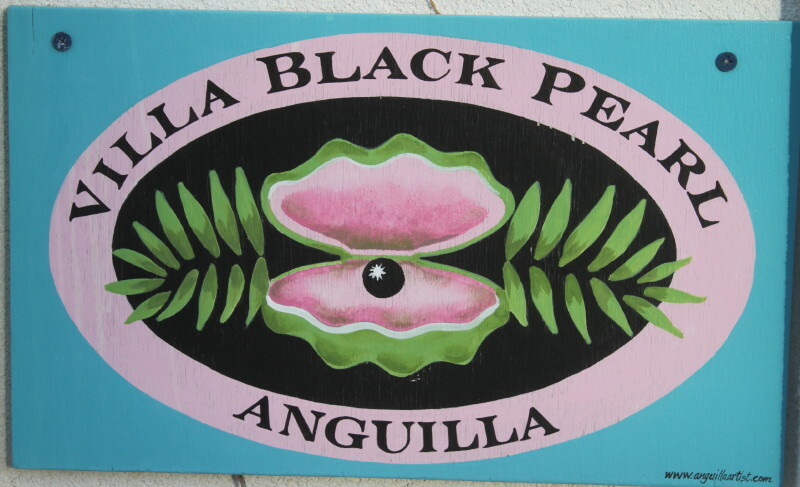 Even before the week at the villa (Black Pearl) in Anguilla ended, the talk was of coming back………..soon. 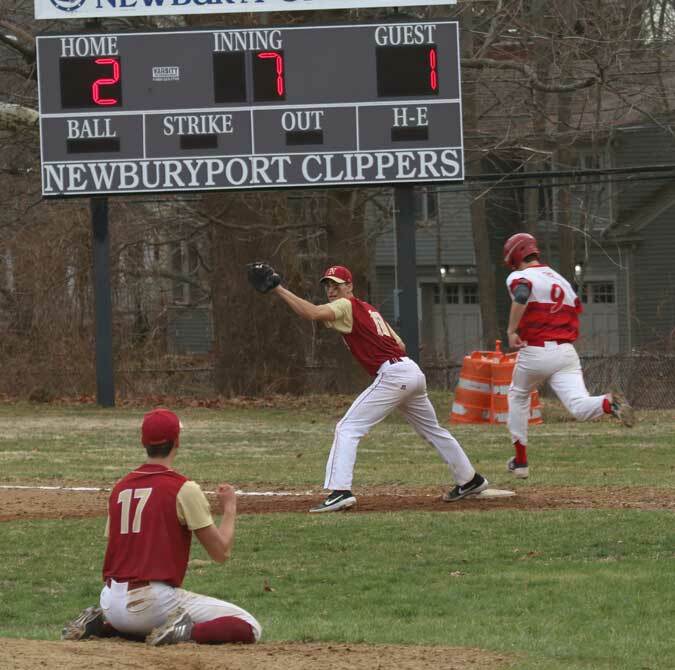 Some reasons why: (1) The weather was perfect – high 70s and low 80s. Those are June/July temperatures where we’re from – Massachusetts. There was a spritzing of rain once and clouds rolling by occasionally but little actual rainfall. (2) The water was warm. This made getting into the ocean easy. There was also a heated pool at the villa. (3) The breezes were steady and tempered what could have been hot temperatures. I got away from the breeze, yet stayed in the sun, once and quickly realized how valuable that breeze was. (4) The beach was white, smooth, lengthy, and hardly occupied. 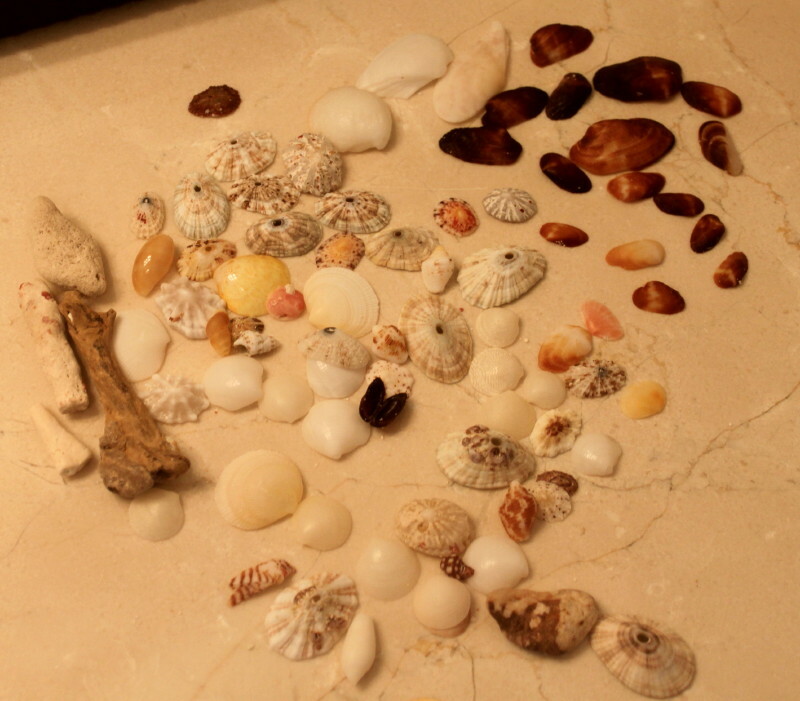 It also had plenty of shells and coral for the beachcombers in our group. (5) The villa itself was terrific. It was roomy and presented views of the ocean from many locations. It also had elevated spots that provided picture-worthy sightings of sunsets and sunrises. 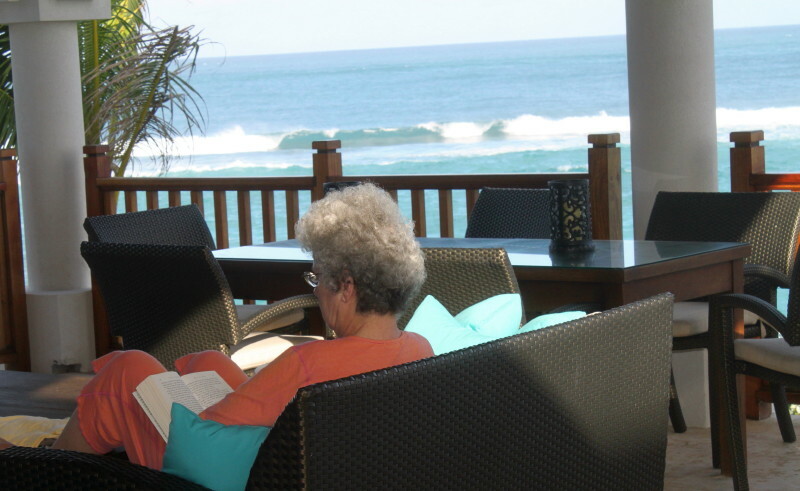 This place also had numerous reading locations both inside and out. I even finished a book – “The Bible Jesus Read” by Phil Yancey. 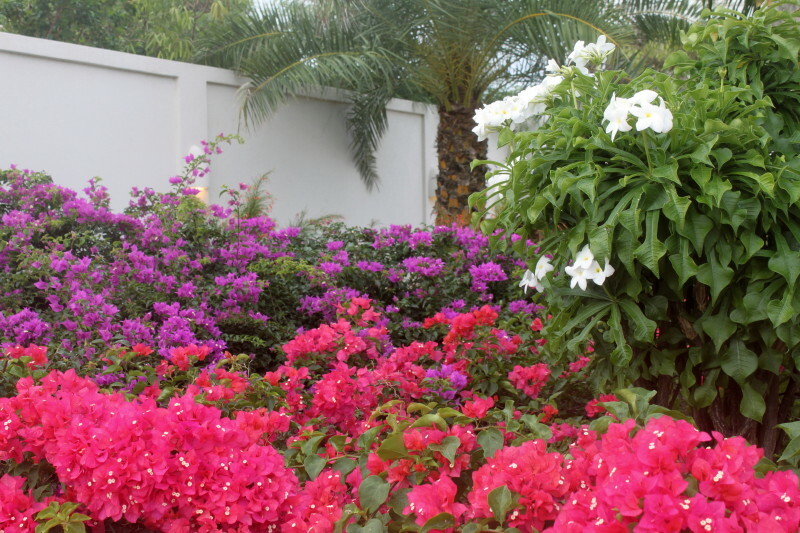 Remarkable colors in the backyard of the Black Pearl. (6) The flowers and the birds were awesome. There were many flowers with brilliant colors. 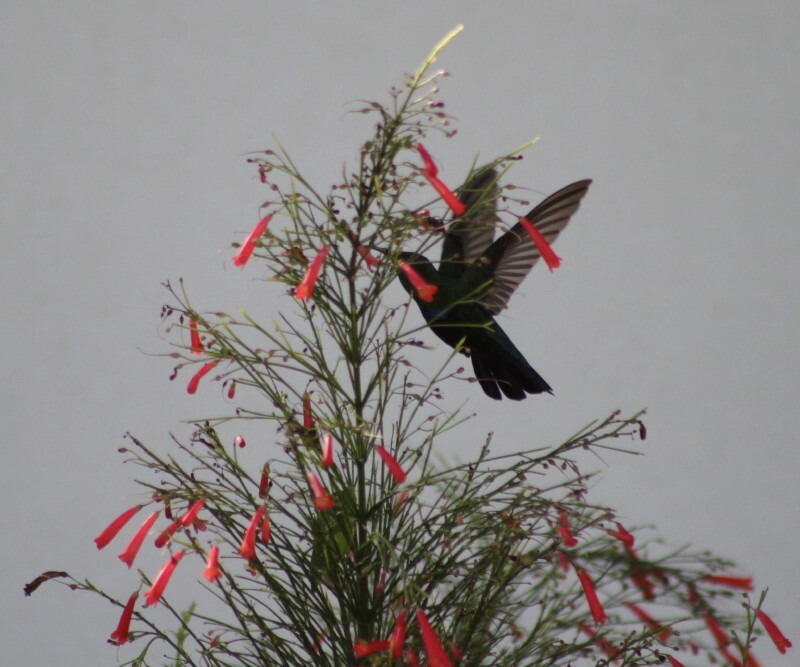 I even saw a hummingbird in some of them. 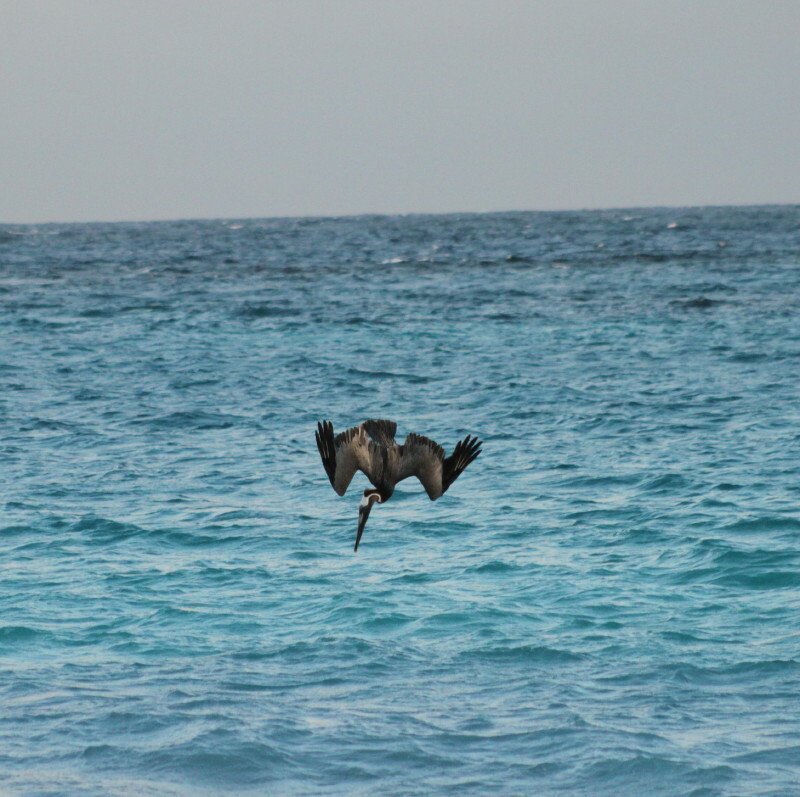 I also saw plenty of brown pelicans and Audubon shearwaters. Both are wonderful diving birds. The water was very clear which surely helped them to spot fish. 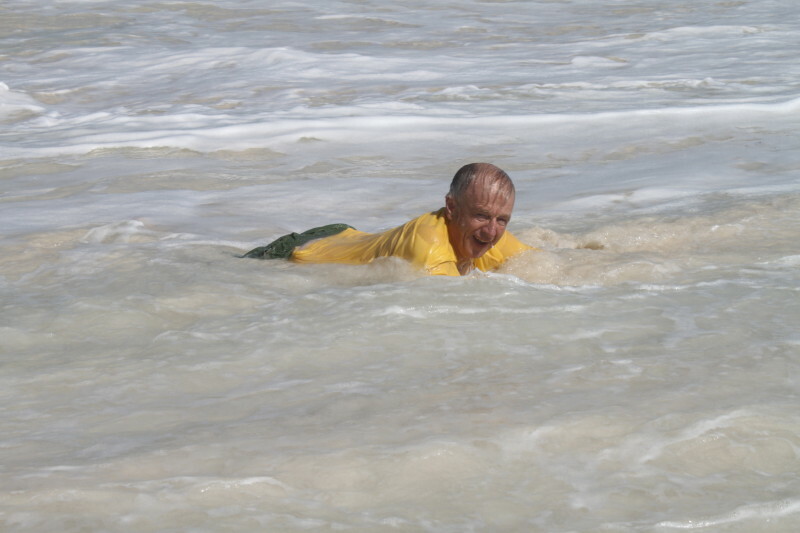 On the windiest of our seven days in Anguilla, I managed to do some body surfing. The waves were breaking nearly on shore. It seemed at times as if I went through more sand than water! I may still be carrying some sand from that experience. There was a steady flow of waves but a couple of coral reefs further offshore limited their size. I talked to a person who had been to this area before and he told me that for much of the year the water in the area we were in is nearly calm, in fact a great deal of snorkeling is usually going on. No chance of snorkeling in the winds and waves we experienced. We flew from New York City direct to St. Martin’s. I think that the flight was 4+ hours. The only noticeable thing regarding airport security from previous trips was a lady in traditional Middle East attire getting a thorough checking at JFK before we headed south and my getting a thorough searching at St. Martin’s, including a pat-down, before I boarded to head north. A guy with a beard and a turban also boarded in St. Martin’s but without any special searching. 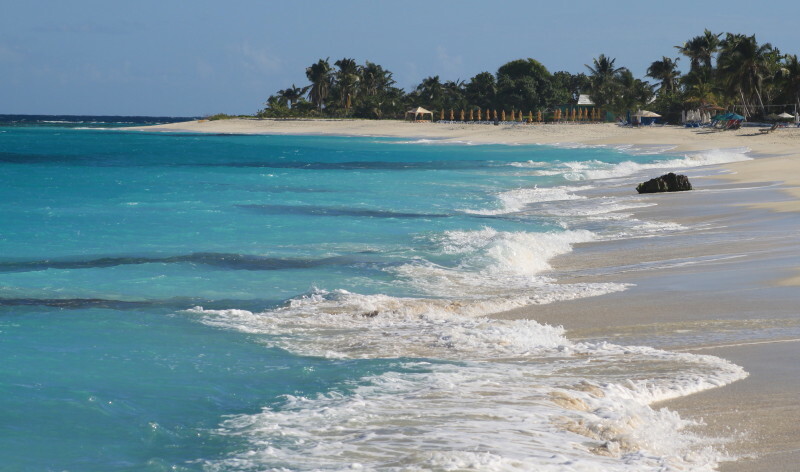 A very memorable part of the vacation was the necessary ferry boat ride to and from Anguilla. That persistent wind I referred to earlier made that 25-minute crossing an up-and-down affair! There were ten passengers on board plus a pilot and his assistant. The pilot said that the crossing is usually a rough one until Christmas. 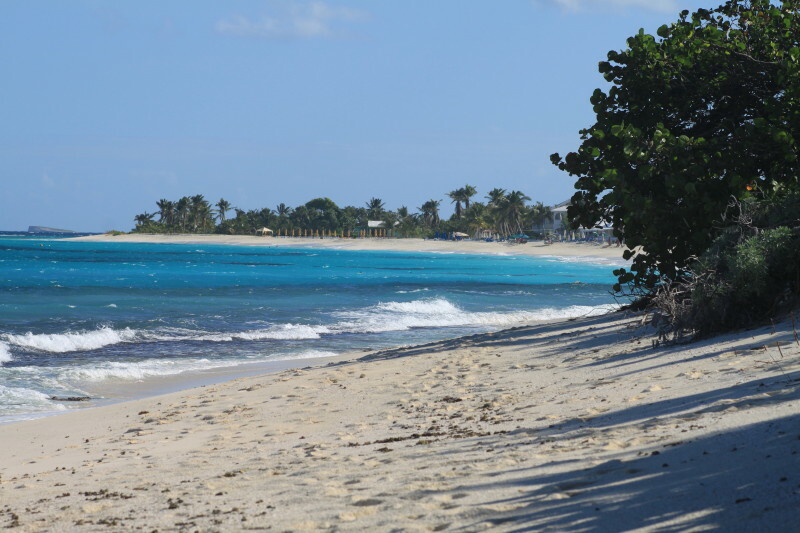 Anguilla is part of the British West Indies. They have turned down the opportunity to become independent. They like being British. They are one hour ahead of us in the eastern time zone. Our location closer to the Equator gave us an hour extra of daylight. There was cable TV available and wireless internet. I had trouble with my computer but that was my fault because I downloaded several updates that really slowed down my computer’s speed. When I returned to the US and did a dated system restore, my computer again ran smoothly. We had a pleasant caretaker who spruced up our rooms each morning and made sure towels were available. She also did some laundry for us. We also were a phone call away from the property manager. She helped us make arrangements to buy food and one morning arrived with some of the best pastry any of us had ever tasted. Time for prayer and time to enjoy God's creation. Two personal highlights for me related to Scripture. In my normal daily devotions I read a selected passage and then choose a verse from it to highlight and write about. I thought of this verse while I was in Anguilla. (Not that there were any significant mountains on the 5-square-mile island.) The idea was finding a place to be alone and pray. I discovered after a couple of days that I could find solitude sitting on the ridges on the edge of the beach early and late. What a verse when you’ve got a beautiful beach and the ocean in front of you! This obvious beauty had to have been created by Someone beyond the human level. There is a God and I was seeing some of His finest handiwork. 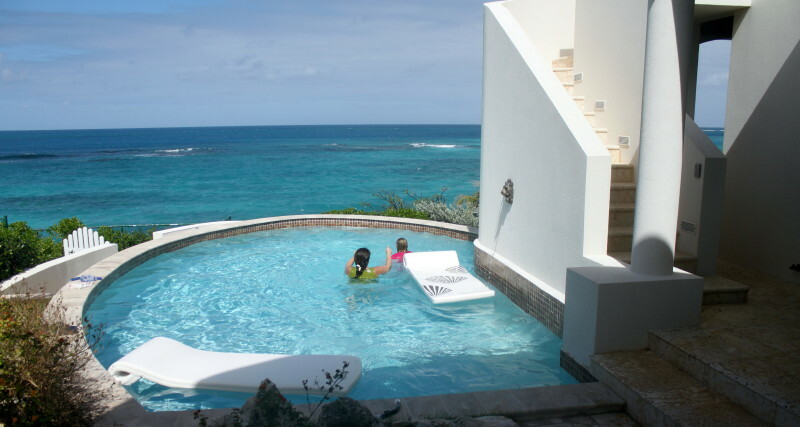 From all the above it comes as no surprise that I would highly recommend a visit to the Villa Black Pearl in Anguilla.